Even small cracks can be a serious matter. Cracked windshields happen and it’s totally okay. Just how accidents can happen to anyone, having a chipped windshield doesn’t mean it’s the end of the world even if it’s from a single rock. But the bigger question to ask, “How long should we wait to repair a chipped windshield?” Answer is, as soon as possible. Here are four consequences of why you shouldn’t drive around with a cracked windshield for long. Our car windshield provides roughly 30% of your car’s structural strength. Your windshield is important to you and your passengers safety regarding protection from road debris, extreme weather conditions, and even other cars or pedestrians. 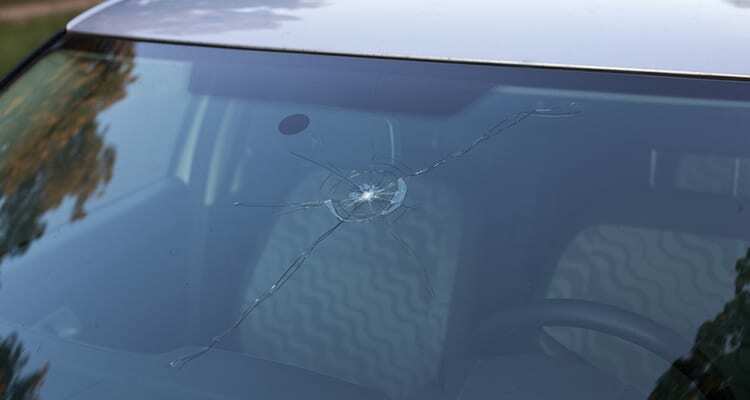 While driving with a chipped windshield, it is not safe at all if another rock or road item hits it again. It’ll cause even more issues and therefore, less protection. Every bump or pothole you hit while driving around with a chipped windshield only makes it bigger. In addition, extreme winds or heat also can cause the crack to grow even bigger. Chances of your chip staying the same size is very slim and might even be more expensive to fix. While your chip is growing and depending on the location of the chip, it can decrease your visibility on the road while driving. This can be very dangerous if your crack is severe, especially when driving at night. It’s better to be safe than sorry by getting it fixed right away to fight the distraction from driving. Elongating the wait to get your chip fixed will only get more expensive. If your chip grows to be more than the size of a dollar bill, you’re most likely going to have to replace the entire windshield which is obviously more expensive than fixing a 2 inch crack for 1/4 of the price.